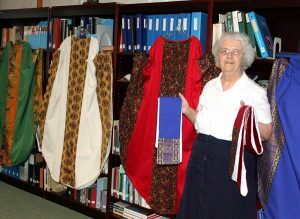 Sister Virginia Brien with a few of the vestments she created. At a very young age, Sister Virginia Brien, SSND, could be found making clothes for her dolls and little sister. As the granddaughter of a successful tailor, talent with textiles is probably in her DNA. “One of my earliest memories of sewing was making a skirt for my younger sister,” Sister Virginia recalled. It is a gift that continues to this day. At Villa Assumpta in Baltimore, where she resides, Sister Virginia often can be found in her first floor sewing room amidst piles of solid and print fabrics, colorful spools of thread and an assortment of tools at her fingertips as she busily repairs a garment or creates a new one, not infrequently without a pattern. It is here where she sews and mends clothing for sick sisters and others. That is, when she’s not collecting and distributing clothing for community outreach or playing the organ for Mass several times a week. Her creative talents are well-known not only at Villa Assumpta and in the SSND community, but in the surrounding community as well. Early in 2015, when Father Paul Zaborowski, OFM, of St. Ambrose’s Parish in Baltimore sought Mass vestments for recently ordained Father Francis Ouma from Uganda, he knew whom to call. 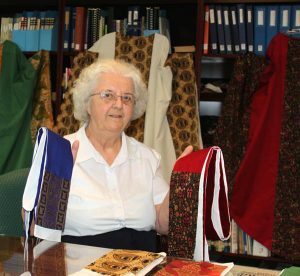 Within a week’s time of cutting the cloth, Sister Virginia had completed five vestment sets that artfully incorporated brightly colored, printed fabric from Africa. Sister Virginia Brien artfully incorporates brightly colored, printed fabrics in work. She said that she is grateful to have been present when the St. Ambrose community officially presented the new priest with the garments. 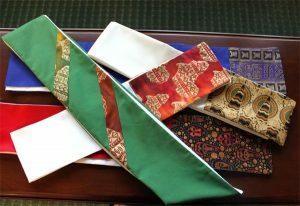 The vestments were displayed like banners after a special ceremony during which they were carried by vestment-bearers dressed in African attire. Sister Virginia has a special place in her heart for Africa, having spent 20 years in Nigeria. She served as a secondary school teacher for 10 years in the diocese of Ikot Epene, followed by 10 years of service to the bishop as his secretary. There, too, she plied needle and thread whenever she was needed. A dozen years ago when she began living at Villa Assumpta, she created baby clothes and other items for the newborns at a nearby pregnancy center. While sewing is her gift, it is certainly not the only one. She is a talented musician and generous with her time and energies including serving in the sacristy for many years.